I'm in love. With dry farmed early girl tomatoes. And not just any dry farmed early girl will do. I'm in love with dry farmed early girl tomatoes from Dirty Girl Produce. 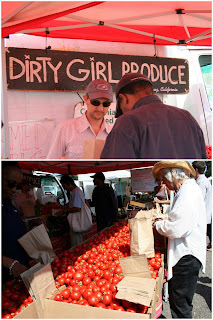 Dirty Girl Produce sells at the the Farmer's Market in Berkeley on Tuesdays and the Ferry Plaza Farmer's Market in S.F. on Saturdays. I discovered their dry farmed early girls a few years ago and have been a faithful follower ever since. Maybe it is because they were my first, but other dry farmed early girls just don't seem to have the same exquisite balance of bright acidity and intense sweetness. Yes, all of the heirloom varieties can be quite beguiling with their rainbow of colors, but now my heart belongs to the simple red early girls. I think they are the most perfect tomatoes on the planet. Even when my own garden is producing lovely red, orange and yellow globes, I can't resist buying some of Dirty Girl's early girls. Ella and I made this pasta for dinner last week. We both loved it. "This is belicious" is how Ella described it. Aside from being belicious, it is also really easy and comes together in the time it takes to boil the water and pasta. You chop the tomatoes and toss them with some olive oil, red wine vinegar and salt and let them marinade while you boil the water and pasta. They will release some of their juices to the sauce and soften slightly. Toss the hot pasta with the the marinated tomatoes and sprinkle with toasted breadcrumbs and basil. The heat from the pasta releases wafts of vinegar which make you salivate before the first bite enters your mouth. It also opens your senses to the sweetness from the tomatoes. The basil brings an almost peppery quality. An earthiness that lingers at the back of your throat. And the breadcrumbs, please don't forget the breadcrumbs. The combination of soft pasta and crunchy breadcrumbs is rather addicting. The quality this pasta depends on the excellence of the tomatoes, so use the best you can find. Cherry tomatoes also work well here. Chop the tomatoes and marinate them in olive oil, red wine vinegar to taste, and salt and pepper. The amounts here are really to taste. I pour in a few good glugs of olive oil, maybe 1/2 cup and a couple of glugs of red wine vinegar, about 1/3 cup. You want the marinade to be nice and bright because the flavors will become muted when you add the pasta. Toss the breadcrumbs with a couple of tablespoons of olive oil and toast in a 350F oven until dry and golden brown, 5-10 minutes. Cut the basil leaves into ribbons, chiffonade. I do this by laying all of the leaves on top of each other, rolling them into a log and making thin slices across the log. Boil the pasta in salted water until al dente, drain and add to the bowl with the tomatoes. Toss in half of the basil. Garnish with the remaining basil and breadcrumbs. yes....belicious indeed, I always forget about breadcrumbs on pasta, Vicenzo loves them, it's really Sicilian. Might make this tomorrow - really, will let you know. Perfect! ...and I just so happen to have some Dirty Girls right now. They were attracting quite a crowd on Saturday. I love them too. Such a simple and lovely dish, yet I've never combined the ingredients exactly as you've outlined above. I'll give it a go. Thank you. I'm obsessed with dry farmed Early Girls. Lucerne Farms sometimes has them for $2/pound, though I've bought some from Dirty Girl before and they are particularly amazing. Just finished our Spaghetti with Tomato Vinaigrette and Breadcrumbs--yum! Thanks for the recipe. I'm glad you tried it and liked it. Thanks so much for letting me know! So crazy! I'm working on my next post right now - the topic? Dirty Girl's Early Girls! How perfect are these tomatoes? I even did I taste test with other dry-farmed early girl's from the farmers' market and none were as good as Dirty Girl's. I made an incredible tomato soup with them. Should have the post up tomorrow night. Ahaa, it's not just me;) They really are the best! And totally worth the price. I'll look forward to your soup:) I was thinking that I would make this one before the season is over. I've eaten some delicious tomatoes, but never a tomato from Dirty Girl. Perhaps I've never reaally eaten a tomato?! Looks fantastic. I have a whole bunch of tomatoes. I overbought. I plan to make this tomorrow. Thanks for helping me plan a menu. Turned out to be very good. Glad I made it. Thanks.